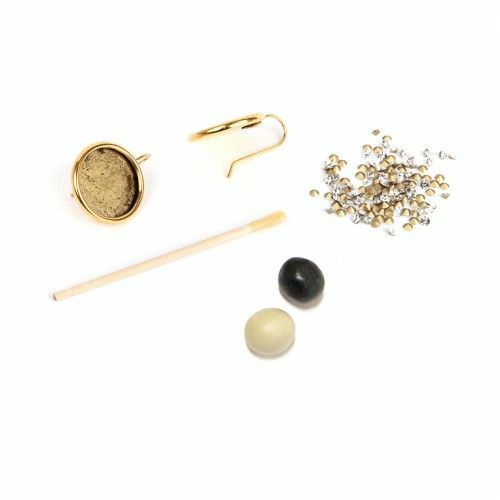 Create a pair of amazing, statement earrings with this Antique Gold Plated Nunn Design Earring Kit with Clay & Crystals. The clay is made up of two parts, an expoxy resin clay and a hardener that you mix together by hand to form a malleable clay. Add the clay into your earrings and then use your beeswax toothpick for easy application of your crystals. Leave your earrings to dry for 14-16 hours - your design will then be fully set and ready to wear! Nunn Design offers beautiful hand crafted pieces of the highest quality, aiming to support and inspire your creativity and individuality. Please note that the gloves included are made from latex. For inspiration and a helpful video, view our blog here!